How does the United States government balance its budget? The Obama administration and Congress seem attached to the notion that balance is to be achieved via a "Grand Bargain" that delivers multiple trillions of dollars worth of savings all at once. Although a Grand Bargain may be welcome, this isn't how our political system operates. On the one hand, the system isn't good at making large expenditure reductions. Consider the distribution of expenditure changes since 1945 (see figure to left). The distribution has power law characteristics: lots of small changes in expenditures and very few large changes. Moreover, expenditure reductions (white dots) are more difficult than expenditure increases (black dots). The frequent but small cuts are smaller than the frequent but small increases, and the infrequent but large cuts reduce spending by less than the infrequent but large increases. In short, the system is much better at increasing expenditures than at reducing them. And, typically it cuts expenditures a little bit at a time. Hence, asking for a substantial reduction in expenditures at one go cuts against the fundamental structure of budget politics in the United States. On the other hand, the system isn't good at increasing taxes sharply. 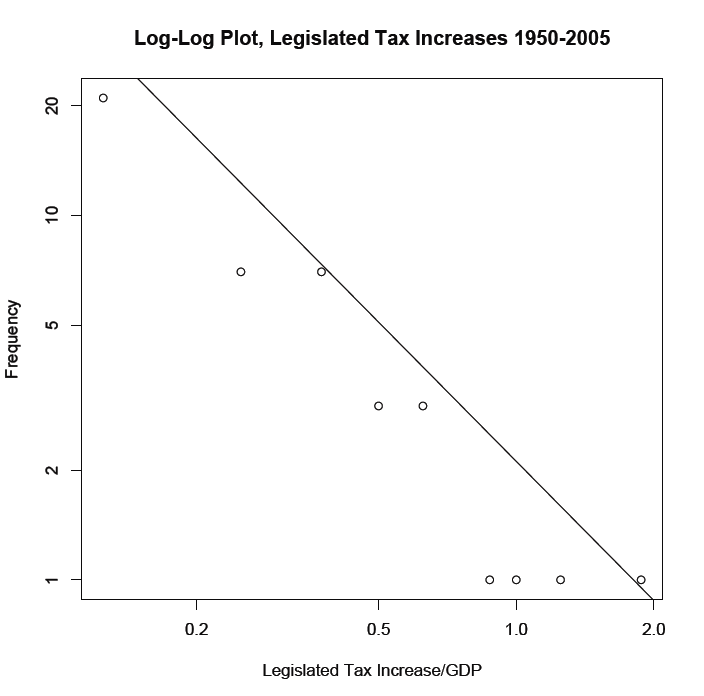 The distribution for legislated tax increases also exhibits power law characteristics (see figure to the right). We see frequent but very small tax increases and very infrequent large tax increases. Moreover, the large tax increases have occurred under pressure of national emergency--mobilization for the Korean War for instance. Hence, asking for a substantial increase in taxes also cuts against the fundamental structure of budget politics in the United States. Seeking to balance the budget via a grand bargain thus asks the system to do the two things it seems least suited to do: sharply cut expenditures and raise taxes dramatically. Both outcomes seem unlikely given the story these simple statistics illustrate. 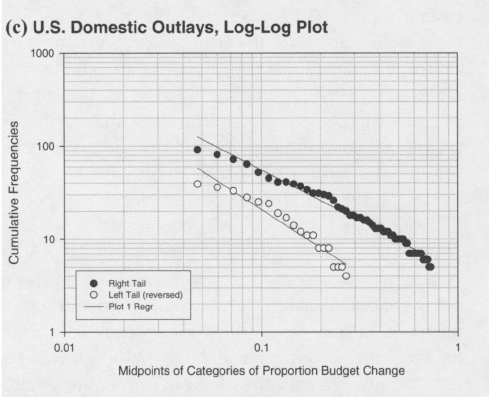 The more likely way the US will move to a balanced budget is not through a Grand Bargain, but through a path that combines frequent but small reductions in expenditures with frequent but small tax increases. 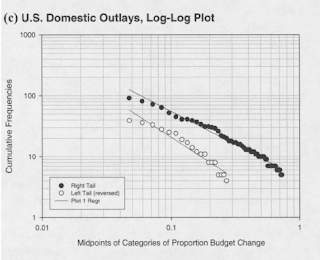 Sources: The Log-Log Plot on US Domestic Outlays is from page 61 in Jones, Bryan D., Frank R. Baumgartner, Christian Breunig, Christopher Wlezien, Stuart Soroka, Martial Foucault, Abel Francois, Christoffer Green-Pedersen, Chris Koski, Peter John, Peter B. Mortensen, Frederic Varone, and Stefaan Walgrave. 2009. A General Empirical Law of Public Budgets: A Comparative Analysis. American Journal of Political Science 53(4): 855-73. 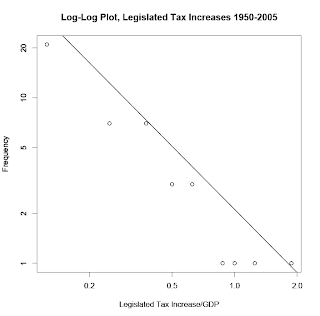 I generated the Log-Log Plot on Tax Increases from data in Romer, Christina, and David Romer. 2008. A Narrative Analysis of Postwar Tax Changes. Berkeley: University of California, Berkeley. I note that my figure on tax increases is provisional as I input that data a couple years ago and never cleaned it so there may be errors. Thus, I am not certain that the distribution is a power law, butit is the case that large tax increases have been very, very rare.